There’s something so comforting about risotto at this time of year. It’s hearty, warm, and makes you feel full and happy. 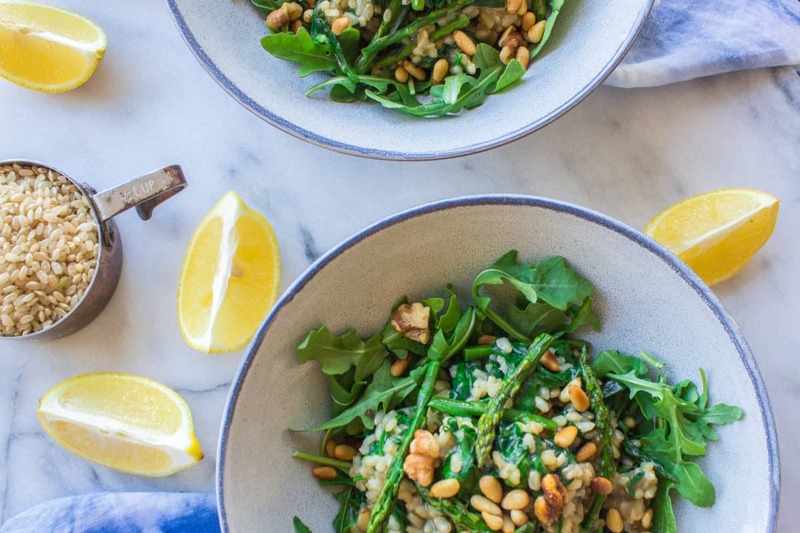 I’m not always a fan of starchy meals as I find they make me feel heavy, but this Asparagus, Spinach and Walnut Risotto is perfect: it contains just the right amount of veggies to make it light, while also providing a satisfying crunch with toasted walnuts and pine nuts. Although not traditionally used in risottos, I’m a big fan of brown rice because I find it heartier and tastier than white. It’s a whole grain so contains more essential nutrients and isn’t considered a refined carbohydrate, unlike white rice. 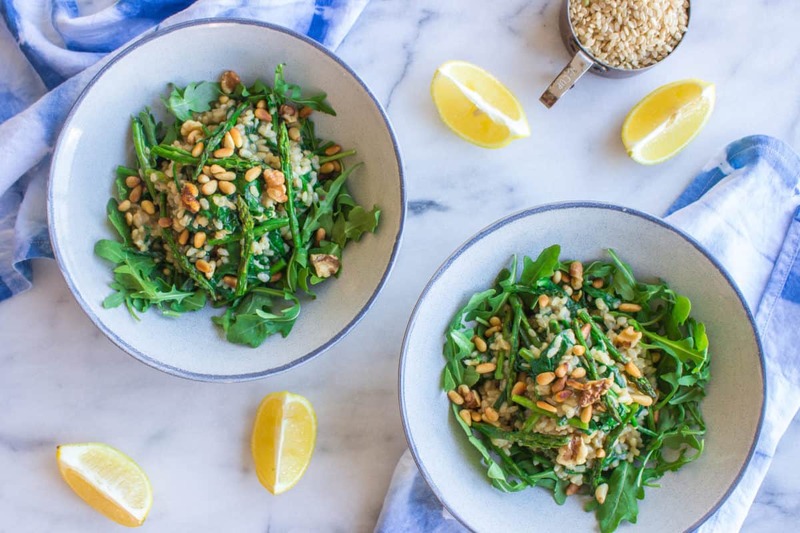 The savoury combination of asparagus, spinach, walnuts and pine nuts is really delicious here. However, I’m all about making recipes as accessible to as many people as possible, and if you can’t find asparagus in your part of the world right now, it’s also great with green beans or even steamed peas! Additionally, feel free to substitute the walnuts and pine nuts for any other nuts that you prefer. Have fun and get creative! This is a fairly simple recipe to make because for the most part you’re just adding liquid and stirring, but it does take time. Risotto generally takes a while to cook because it’s uncovered and the rice absorbs the liquid slowly, in turn releasing its starch slowly (to create a creamy, rather than gummy texture). Stick with it! The results are worth it. Be sure to use short grain rice – long grain, basmati or jasmine just don’t have the same starch content so won’t give you that delicious risotto texture! In a large pan, melt the coconut oil and gently sauté the crushed garlic for 2-3 minutes on a low heat, stirring constantly. Add the rice and sauté for another 3 minutes on a medium heat, continuing to stir. Add ⅔ cup of the stock/broth to the rice and stir. Ensure it is bubbling and leave it to cook for about 10-12 minutes until the liquid is absorbed, stirring occasionally. Then stir in another ⅔ cup of the stock and leave to cook for 10-12 minutes, repeating this routine until all the stock is used. Meanwhile, prepare the asparagus and the nuts. In a small skillet, gently toast the nuts on the stovetop on low heat for 10 minutes, using a spatula to turn them occasionally. When lightly browned, remove from the heat and set aside. Trim the woody lower parts of the asparagus spears, and slice each into 3 or 4 pieces. Brushing them lightly with olive oil and seasoning with salt and pepper, grill them using your oven’s broiler (top heat only) for 5-10 minutes. Asparagus tends to cook fast, so as soon as you see its colour get brighter and it starts to soften, it’s done! Remove from the heat and set aside. Once you’ve used up all the stock and the rice is nearly cooked, add ½ cup of coconut milk to it and stir, allowing it to cook for a few more minutes until the milk has been absorbed and the rice is tender. 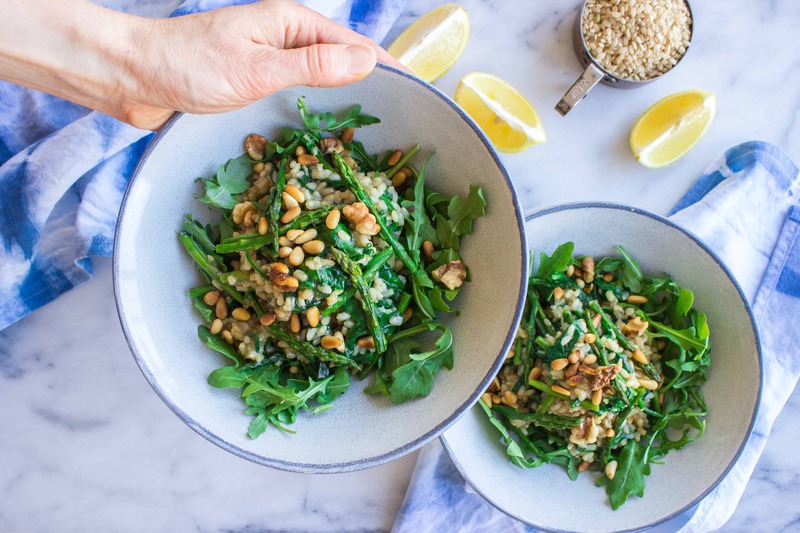 Divide the arugula leaves between two bowls and heap the risotto on top. Serve with lemon wedges and season to taste with salt and pepper.